Looks like an epic day coming up on Maui. Looks like Hurricane Lanes' rain is holding off on the north shore of Maui. Hope to see some awesome videos on Youtube in the coming days. Should have grabbed the last minute BOS-OGG $600 RT ticket which was available a few days ago and the $105/nt waterfront Airbnb private room in Paia that was available. Good luck for those lucky souls in paradise. Shred it up guys/gals! I'm guessing this post is sarcasm, but not entirely sure. Do you think people will sail the storm? I've never sailed Maui and am not a pro, so my experience obviously doesn't compare directly, but we have sailed the periphery of some hurricanes and tropical storms on the Gulf Coast. It's fun to conquer that within reason, but it's storm conditions, meaning sloppy waves, strong currents, and occasional debris floating below the surface that you can't see because the water is so churned up and cloudy. The fun is more in the conquering than in the conditions themselves. 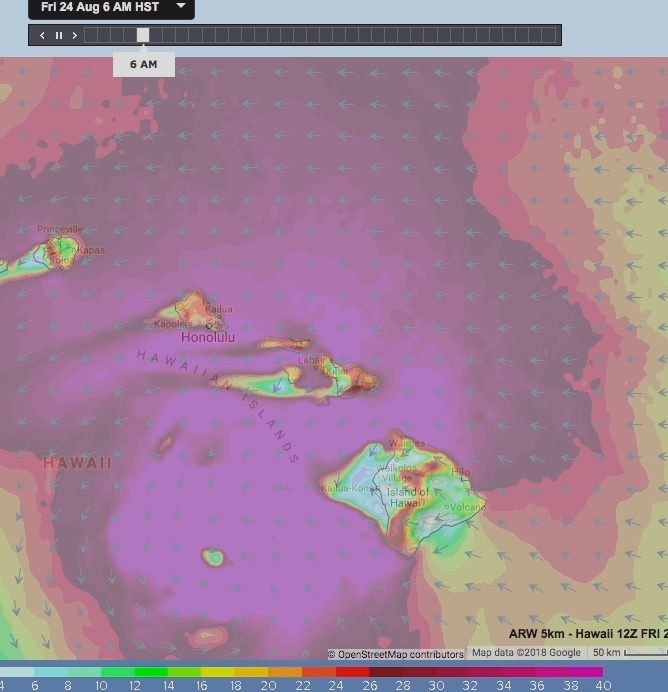 I imagine the average level sailor on Maui (especially those who would consider storm sailing) is high and they'd be good at gauging where to draw that line of adventure vs. foolhardy. I hope everyone stays safe and the islands come through as best possible. I would also love to see any pictures/reports from a windsurfing perspective as time goes on, even if not actual sailing, then how the launches and breaks fared. Our main summer wave break definitely changed from Hurricane Harvey (though our bottom is sand and a much different situation than volcanic islands). Never saw anyone sail in storm conditions on Maui when I lived there. Why would anyone want to? I was on Maui in 1985 when a hurricane hit. After it passed there were sailboats on the other side of the road. There was hardly any wind and Hookipa was easily 60' plus faces, one after another. I was just mesmerized watching this. Easily the biggest waves I have ever seen in my lifetime. Wasn't exactly closing out, was breaking from one side to another, meeting in the middle whereupon several tons of water would explode off the top. No takers, was 'death on a stick' out there. If I had known about Jaws at the time, would have taken a look. What airline was giving 600 rt ? I got back last week ,I paid $850 and thought it was a really good deal. That was American, and I bring my own gear, for $150 each way. As far as sailing , had wind every day for 16 days, and most days swell at uppers. Some days very gusty, as it can be there, also one day gusting to upper 40's , too much for me, and locals even commenting it was as windy as they have seen it, for quite awhile. One observation, I see the same people year after year, locals and visitors, and everyone is just getting older. This is at Kanaha, Hookipa may be a bit different. As far as Hurricane Lane, Kanaha was closed, for the time being. The $600 fare was with American. Was planning of renting gear. Wow! $600.00 is a great deal! Lived there in 1990 from early April till the end of November and probably sailed about 150 days. My big sail was a 5.3, smallest a 3,7 which saw a lot of use in Kihei. Early June through September I sailed nearly every day. No Hurricanes that year. Oct.- Nov. winds were not as consistent but the surf can get huge! 18-22 feet one day at Kanaha with an easy launch. I would not plan a trip there if there is a Hurricane out there They can shut down the trade winds. I got skunked one year because of this.